The baking season has officially begins!! Sorry to those who dropped by my blog. 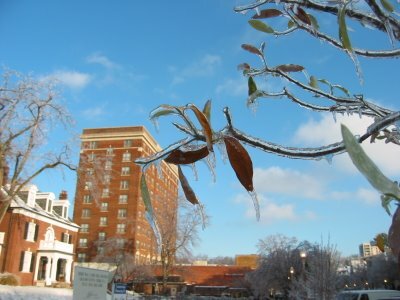 I have been wanting to update my blog but was deterred by a series of activities. It's nothing too exciting. 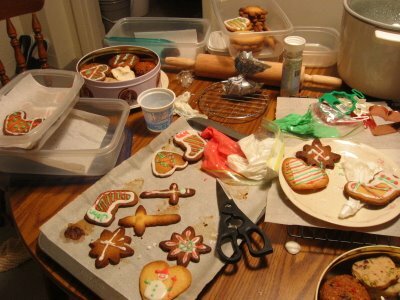 I was only busy baking and cooking during the festive season. There wasn't a day gone by without some form of baking. 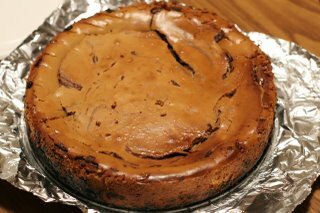 Other than the Yule log I made for the dessert competition, I also made a Latte Cheesecake Brownie for OCT's potluck lunch. It was my favorite coffee cheesecake so far, although it was not a light one. It was too delicious that I had devoured the leftover without taking a photo of it. It was a good cake and I am sure I will find another occasion to bake it again! 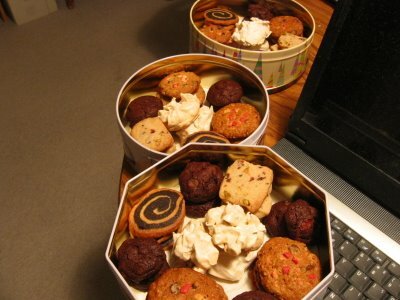 Plenty of cookies! 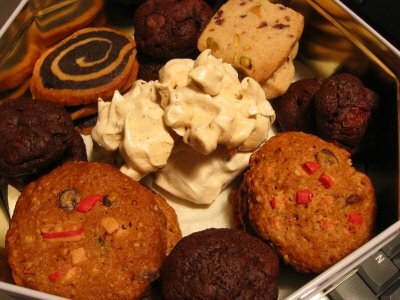 Which include Bittersweet Chocolate Meringue, Black Forest Cookies, Peppermint Chocolate Chips Cookies, Spiral Cookies, Biscottis and Pistachio and Cranberries Cookies. 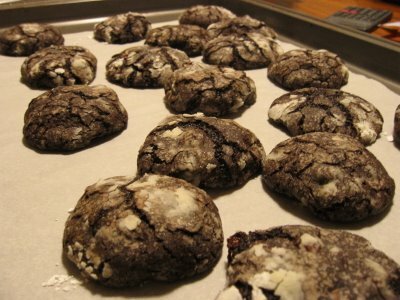 The Chocolate Crinkles didn't make it to the final though, because of its disappointing appearance. (of course it's the baker fault). 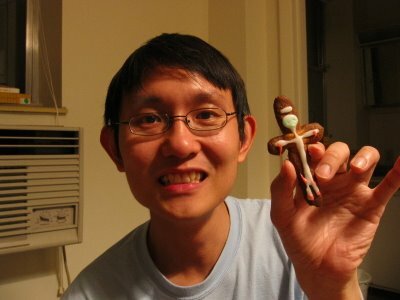 And a close look on the content: OCT posing with one of his creations. Inspired by the reason for the season- To remind me that Christmas is about the birth of the son of God, who die on the cross for me and others, so that we can live. 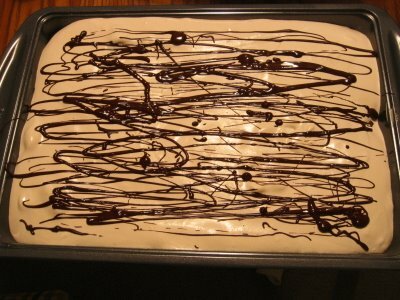 On a Christmas Eve party, I brought the One Bowl Mocha Cream Cake, which was interesting. It was a cake made without butter and eggs, but used mayonaise and marshmallow creme! 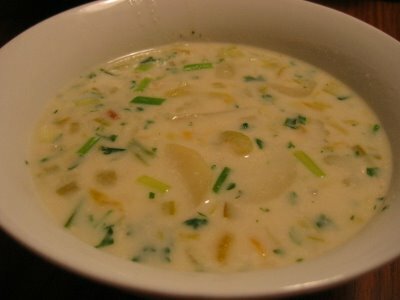 A low fat recipe, but doesn't taste so at all! Besides all the festive baking, I also managed to squeeze in an apple crostata for our after dinner dessert. Although I took the shortcut of using a ready made pie crust. It was a good vehicle to use up some of the Edy's Pineapple Coconut ice cream that we really didn't care to eat on its own. For some inexplicable reason, apple crostata (or any other form of apple desserts) tastes nice with vanilla (or other white colour) ice cream! Two days ago, OCT alerted me of his department's annual dessert competition. And I wanted to join. Firstly because it gave me an opportunity to make something unusual than stuff I usually bake. And quite frankly, for the prize. Although at that point, I didn't know what the prize yet. So, I spent the better half of yesterday in the baking project. 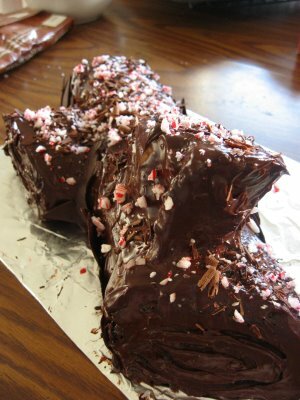 After some careful consideration, I decided to make a Chocolate Christmas Log. It'sa recipe with no flour and no butter but with lots of bittersweet chocolate. I tried some of the scrape, and they were tasty! I considered that as an auspicious start! After the cake base was cooled, I went on to decorate my Christmas log with my limited decorative skill. 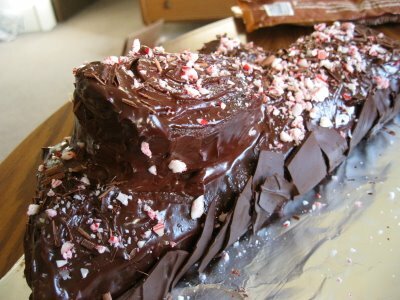 Luckily it's only a log cake, so I could simply pour lots of chocolate ganache over the cake, and sprinkle some crushed peppermint candies and chocolate shaving on top of it. It definitely has plenty of room for improvement, but I guess this should do for now. 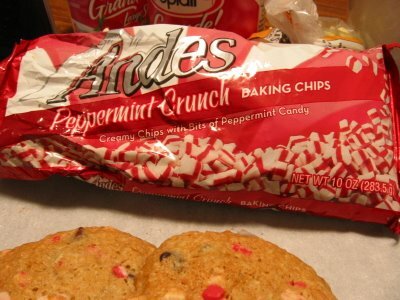 Two hours after I happily put the cake into the fridge, I found that the crushed peppermint candies melted! There wasn't much I could do about it since it was already quite late. Without the candy, the Christmas log seems like a boring and dull log. Well, even if it has become an ugly log, I still had to submit my item. Well, at least there's something. And I definitely see this as a good beginning. In the end, I opted for something that I have tried before with fairly good results. They were baked to be sent to a special friend. Because she sometime reads this blog, I guess I better keep the details out, and show you just a peep of what I have made. 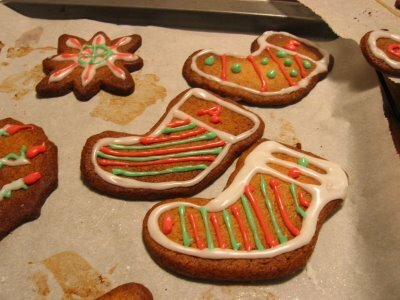 According to the recipes, these cookies travel and keep well. Certainly suitable to be made and mailed to a coutry far far away! 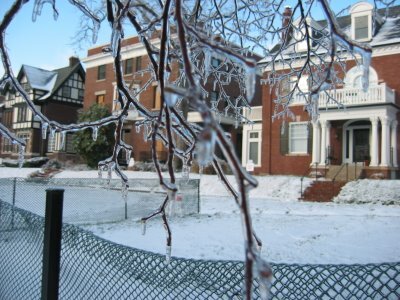 This is what happened: Practically everything is frozen. 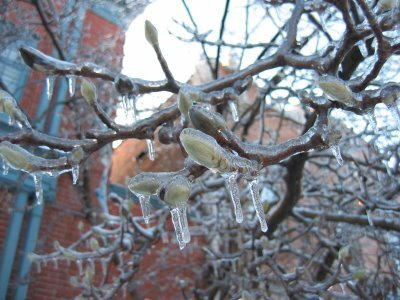 It's stunning to see bald, frozen trees for the first time in my life. The same trees that bloom in Spring, and turn golden when Fall beckons. Melt butter in a Dutch oven over medium heat; add asparagus, onion, hot sauce, and red pepper. 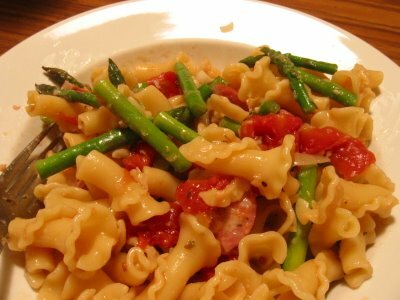 Cook 5 minutes or until asparagus is crisp-tender, stirring frequently. Stir in pasta, salt, black pepper, chicken,tomatoes and a splash of red wine; cook 2 minutes or until thoroughly heated. Stir in cheese; sprinkle with paprika. What a name! 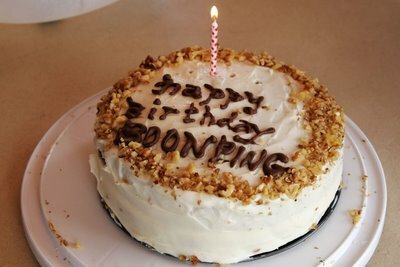 I made this cake for my friend BP's birthday lunch last Sunday. It's a cake my friend MY told me so much about, but was readily forgotten until being reminded by Martha Stewart on her Baking DVD. Seeing that woman made the cake on her DVD almost guaranteed the delicious factor of the cake itself. So, I decided to make this moist and light cake for BP. And added heaps of delicious cream cheese frosting as backup. You know, just in case the cake turned out too bland. The cake proved that my worry was unnecessary. It was moist and tender. Thanks to the mashed banana and crushed pineapple. 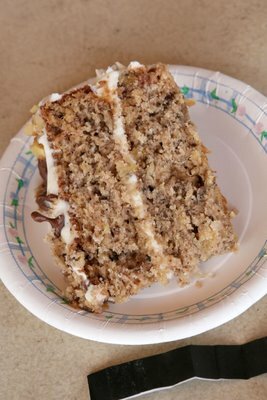 For the uninitiated, the Hummingbird cake tasted like a cross between banana cake and carrot cake. Martha's version used coconut flakes, which I omitted. 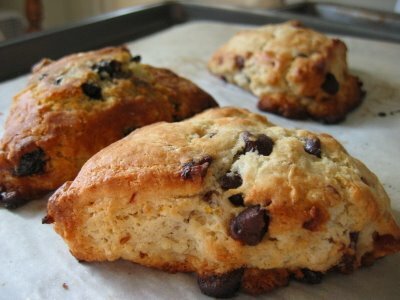 I found another version from Southern Living that used almost the same proportion of all ingredients with good reviews and decided to use it instead of Martha's. 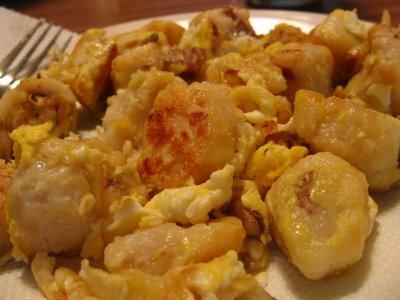 I think I will give Martha's version a try when I got some bananas again. I guess I should also mention that it's one of the easiest cake to make because you can stir everything together in a big bowl without the help of a mixer. Perfect for a novice baker like myself! Note: To cut down on fat, the hummingbird cake can be made in a Bundt pan without the frosting, or with a simple drizzle of icing sugar. Last Thursday was Thanksgiving. Though we are non Americans, and weren't being invited to any Thanksgiving dinner, that couldn't stop us from celebrating this meaning day with some friends coming over for a traditional Thanksgiving meal. 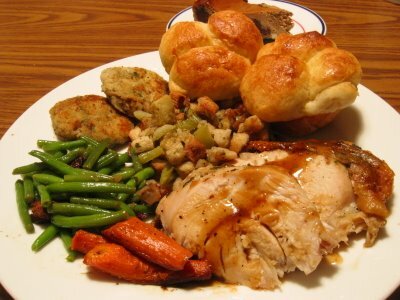 Thanks to numerous cooking magazines, I know that a typical Thanksgiving meal should include: Turkey, mashed potato, green bean, gravy,stuffing, dinner rolls and pumpkin pie. Of course the list could go on if you were serving more guests. I wouldn't mind cooking for more people if not of the limited space we have in our tiny apartment. Anyway, I guess a simple menu will do for now. 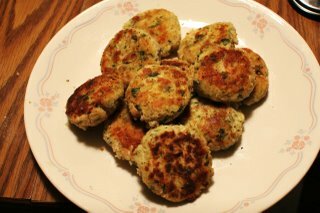 Other than the compulsory roast turkey, green bean and mashed potato, I made lemon horseradish fish cakes as appetizer. It also served as a backup in case the roast turkey didn't turn out fine. 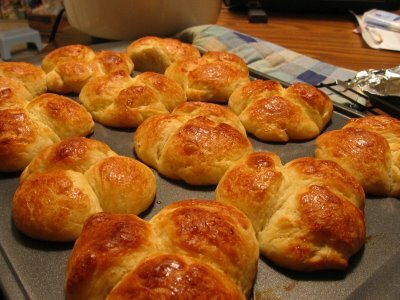 And I almost forgotten about my dinner rolls, which I made the night before. They were tastier the night I made them though. For dessert, I made a espresso and chocolate swirl cheesecake. 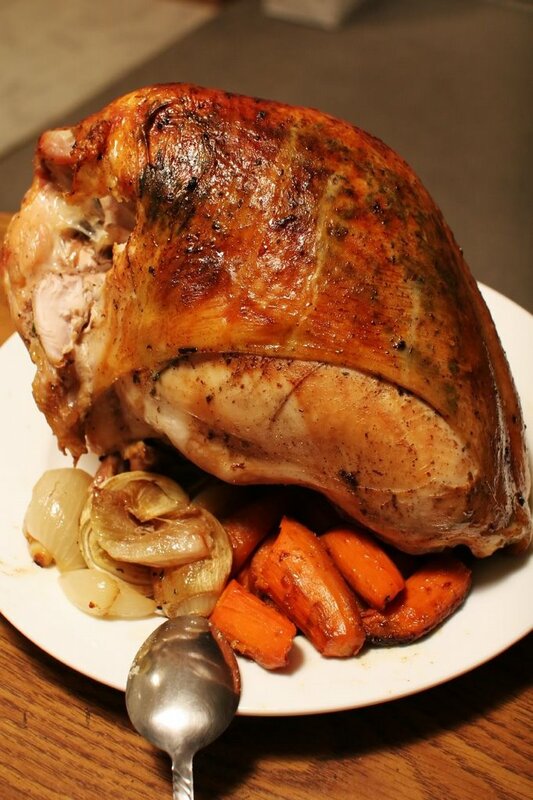 This was made 2 days before Thanksgiving, so that the flavor had enough time to mend. Unfortunately, 2 days seems not long enough. OCT and I both find that it tasted the best after sitting for 5 days! Anyway, I don't intend to bake this cake anytime soon. There are too many cheesecake recipes waiting for me out there! Nevertheless, this cheesecake which is not too sweet ended our dinner on a good note. Eventhough it wasn't a feast, we still had plenty of leftover! 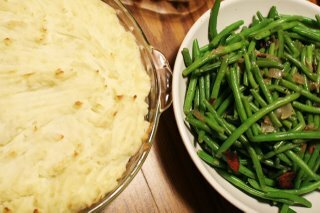 Which was turned into another mini Thanksgiving meal for just the two of us on the next day. And yes, the photo below was only part of the leftover. Heat the milk and butter just until the butter melts. Let the mixture cool until it's tepid. Measure the flour into a large bowl and make a well in the center. Pour in the tepid milk and the yeast mixture. Add the rest of the sugar and the oil, egg, and salt. Mix the ingredients thoroughly, gradually drawing in the flour to form a soft dough. Turn the dough onto a lightly floured work surface. Push the dough away from you with the heels of your hands, then fold the dough over itself and give it a quarter turn. Repeat this pushing, folding, and turning, adding only enough flour to keep the dough from sticking to the table, until the dough is smooth and elastic, about 5 min. The dough will be softer than ordinary bread dough. Put the dough in a greased bowl and then turn the dough over so the greased side faces up. Press plastic wrap onto the surface of the dough and leave it to rise until doubled in volume, 45 min. to 1 hour. Gently punch down the dough and then let it rest for 5 min. before shaping. Lightly butter a standard 12-portion muffin tin. With your hands, roll the dough into a long cylinder about 18 in. long. Use a dough cutter to divide this in half and then cut each half into six equal portions. Divide each of these 12 portions into three sections for a total of 36 pieces. Each piece should be approximately the same size. With your palms, lightly roll each piece of dough into a smooth ball. Cluster three balls of dough in each cup of the muffin tin. Brush with a little melted butter. Allow to rise for 40 to 50 min., or until doubled in volume. Position rack in center of oven and preheat to 400°F. Grind cookies in processor. Add butter and process using on/off turns until crumbs are moist. Press crumbs on bottom and 1 1/2 inches up sides of 9-inch-diameter springform pan with 2 3/4-inch-high sides. Wrap outside of pan with aluminum foil. In small bowl, dissolve instant espresso in 1 tablespoon water. Using electric mix, beat cream cheese in large bowl until smooth. Add sugar and continue beating until mixture is light and fluffy. Add eggs 1 at a time, beating well after each addition. 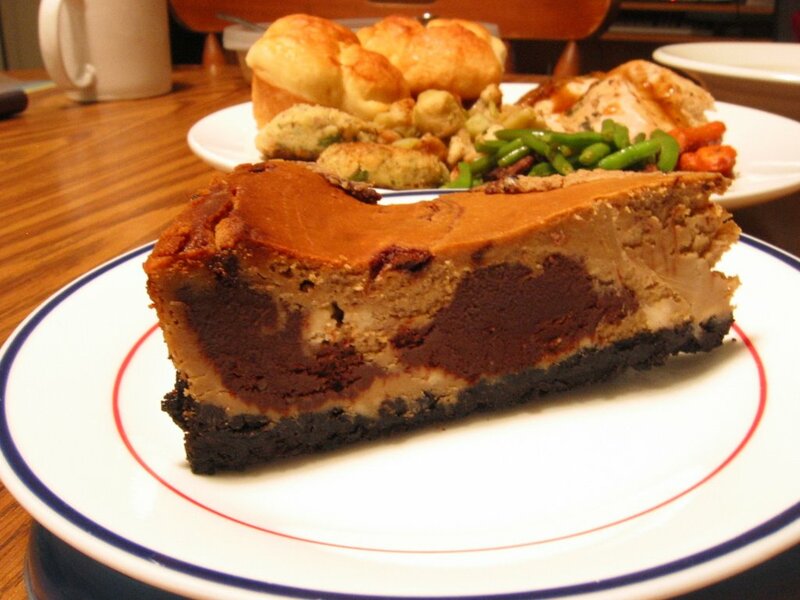 Mix in espresso mixture, butter and ground coffee beans. Combine chocolate and cream in heavy small saucepan. Stir over low heat until chocolate melts. 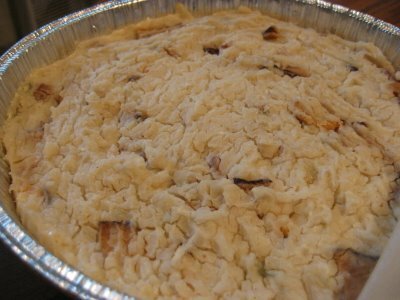 Pour half of cheese filling (about 2 1/2 cups) into prepared crust. Drop 5 tablespoons melted chocolate mixture by tablespoons around edge of filling, spacing evenly. Use small sharp knife to swirl chocolate into filling. Carefully pour remaining cheese filling over. Drop remaining chocolate mixture by tablespoons into center 6 inches of filling, spacing evenly. Swirl mixtures together using tip of knife. Run small sharp knife around edge of pan to loosen cheesecake. Release pan sides. Let stand at room temperature 30 minutes. Transfer to platter and serve. and I haven't done any updates on my blog. Sometime I am not motivated to write because most of my friends don't read this blog. It feels like talking to the air and myself most of the time. Anyway, I guess I will blog less often from now on, but I still need a space to record the new recipes I try from time to time. Sometime we tried so many new recipes a week that we hardly remembered what we had for dinner few days ago! The main breakthrough for me last week was definitely the chinese turnip cake. 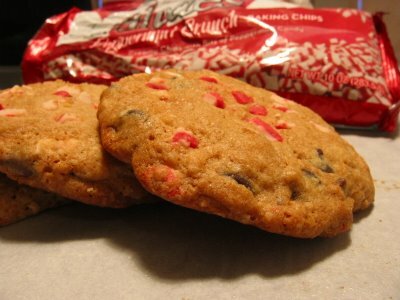 And I made a nice batch of cookies using a new-to-me ingredient- peppermint chips! 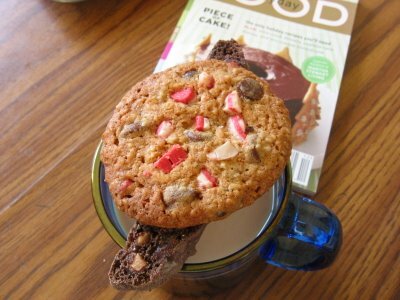 I used a basic chocolate cips cookies recipe, and added in some peppermint chips for colour. I gave some to the maintenance guy who came and worked on our bathroom tiles for 2 days. He seemed to like them, and told me that his 3 kids liked the cookies too! After having Turkey on the covers of most cooking magazines I subscribed in November, they were either cakes or cookies on their December issues. I can't complain. Afterall, I prefer cake or cookies to turkey! I have craving for chinese turnip cake for weeks, and I had even bought the necessary ingredients 2 weeks ago, all set to have my first try on turnip cake. Honestly, I am not too confident when it comes to making chinese pastries. All the recipes I googled seem to be vague. And there's no way I can determine the "workability" of the recipes except of trying it myself. Because of this, I hesistated. For the fear of failure and the disappointment that follows. Anyway, I went ahead and made my first ever chinese turnip cake, after comparing a few sources, and plenty of courage and some common sense. It turned out ok, but could definitely be improved on. See the "wrinkles" on the surface? I still don't know what the problem is. I guess the turnip cake can be kept in refrigerator for a couple of days. But it didn't last that long. 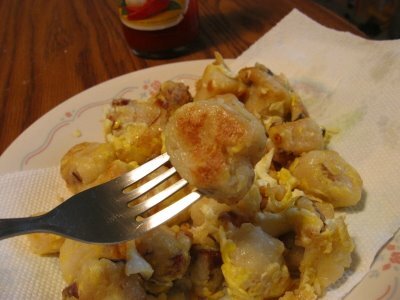 For I fried some with garlic and egg to eat as lunch,and the rest for dinner. OCT wasn't as crazy as I was on turnip cake, but he seemed to enjoy his share too. I love our dinner yesterday! The oven fried chicken was the best fried chicken I have ever tasted in my life. Ok, I exaggerated, but it was because the chicken was really tasty and healthy. Maybe healthy is not the right word too. But if you can use only 2 tablespoons of oil to get 6 huge pieces of crunchy chicken thighs, you can call that healthy right? This is a recipe from October issue of Cookinglight magazine. 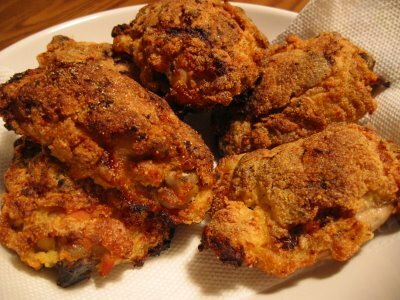 The idea of using oven to fry chicken is intriguing, definitely too good to be true. I thought if it really turned out like the real thing, then it will be the next best thing other than the crispy roast potatoes, another favorite of mine which I cook to curb my craving for french fries. The chicken turned out to be a winner! It was everything a fried chicken should be. Crispy, crunchy and tasty. With this recipe, I have another excuse to buy cheaper cut of chicken more often! OCT who is a fried chicken fan will not be deprived of having some "fingers licking good" stuff anymore! 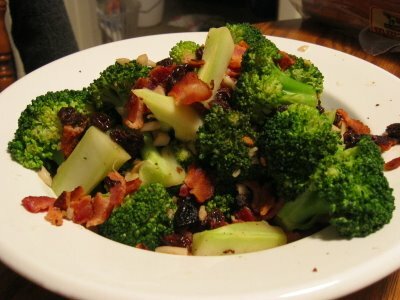 Another new recipe for last night was broccoli with hot bacon dressing. It was a good alternative to our otherwise simple version of chinese style broccoli with mixed veggie and oyster sauce. I like the idea of using rice vinegar + raisin+ bacon + garlic as dressing. It was an interesting combination. Cover a large baking sheet with parchment paper. Combine buttermilk and egg whites in a shallow dish; stir well with a whisk. Combine flour, cornmeal, 1/2 teaspoon salt, black pepper, and red pepper in a separate shallow dish; stir well. Sprinkle chicken evenly with remaining 1/2 teaspoon salt. Dip chicken in buttermilk mixture; dredge in flour mixture. 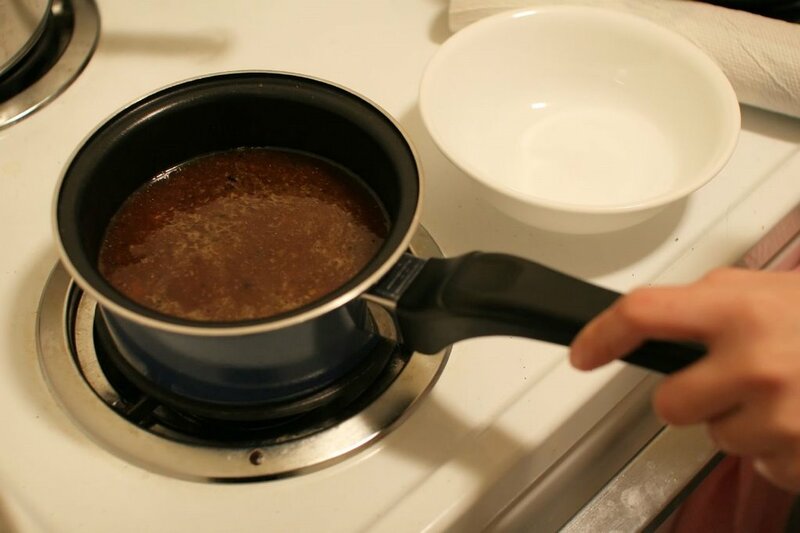 Heat oil in a large nonstick skillet over medium-high heat. Add chicken to pan; cook 4 minutes on each side or until lightly browned. Place chicken on prepared baking sheet; lightly coat chicken with cooking spray. Bake at 425° for 30 minutes or until chicken is done. Peel broccoli stems with a vegetable peeler, then cut crosswise into 1/4-inch slices. Cook bacon in a 12-inch heavy skillet over moderate heat, stirring occasionally, until browned and crisp, 4 to 5 minutes. Transfer bacon with a slotted spoon to several layers of paper towels to drain, leaving fat in skillet. Add garlic and raisins to skillet and cook over moderate heat, stirring, until garlic is pale golden, about 1 minute. Stir in vinegar, oil, salt, and pepper, then remove from heat. Meanwhile, cook broccoli florets and stems in a large pot of boiling salted water until just tender, 4 to 5 minutes. Drain broccoli well and transfer to a bowl. Bring dressing to a simmer, then cook, stirring, 1 minute. Pour hot dressing over broccoli and sprinkle with bacon, tossing to combine. I haven't being updating my blog lately. I guess I just lost the momentum after I stopped blogging for a few days. Also, I thought I could do more "life-enriching" stuff, like reading, when I was offline. But I was wrong! I ended up spending most of my time on youtube, the addictive Hongkong series people uploaded kept making me to go back for more. And the book that I started two weeks ago was still lying at the spot I left it, collecting dust. So this is what I have been doing lately. Luckily for me, and for OCT, dinners were still streaming out readily from kitchen. I managed to try a few new recipes the past weeks and are planning for more in the coming weeks! But before that, let me recall what I have made last week. A batch of sao pao that leaks, unfortunately. So my quest for the ultimate sao pao hasn't ended yet. There were tasty though. But I need to work on the dough, so that it will not burst open again in the oven. Initially I thought it's either because I didn't seal them tight or I didn't poke holes on top of the pie, so pressure built up and it burst. 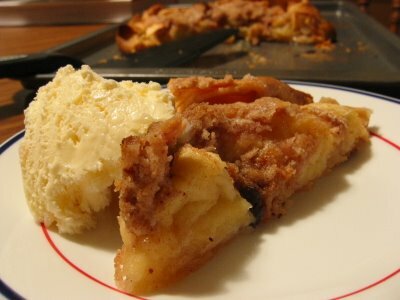 But the second experiment that involved the same dough, but with apple pie filling proved that it's none of the above. My mum guested I may have overworked the dough or the oven temperature was too hot. Or maybe the dough was intended for quiche not turnover, etc. I decided to look for another recipe. I have given the dough enough chances, so it's time for it to go. 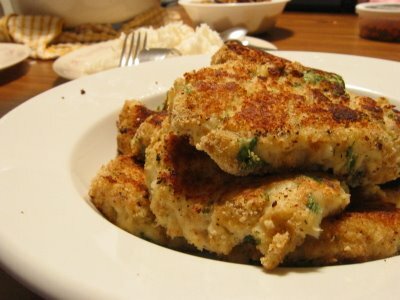 One night, we had lemon horseradish fish cake. You can't see the horseradish from the picture because they were subtly mixed into the fish cake. OCT who didn't know what he was eating and raved about this dish. I got this recipe from Oct issue of Everyday Food. You can also freeze the patties individually and cook them on another occasion. Say when you have special guests over for dinner. Of course you can get this kind of stuff from the grocery store's freezer section, but at least you know what you put in the fish cake and how long it has been frozen. And it's a flexible recipe. You can use any fish here, I think. All you need to do, is to first roast the fish in the oven for 15-20 minutes until it's cooked. 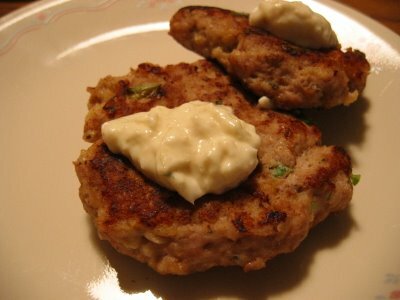 Then use a fork to flake it, and add mayo, prepared horseradish, lemon juice, some chopped parsley, eggs, bread crumbs, and salt and pepper to taste. Form them into small cakes and coat with extra bread crumb and they can be cooked immediately, or freeze for another day. I know the instructions are lame, so if you are really interested, drop me a comment, and I will type out the recipe. 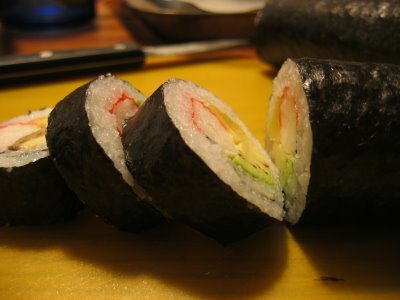 :) Tuesday night, I had a suddenly craving for sushi, so I made some for myself. But I overestimated the amount and ended up having 5.5 rolls! It's going to be my Tuesday dinner and Wednesday lunch and dinner. I brought 2 rolls to school so that I could have lunch with OCT on Wednesday, but we changed our minds when the lunch hour approached and went for the nearby Greek restaurant for gyro and roast leg of lamb. So the sushi was left in OCT's lab. I asked him to give some to his colleagues, but he was a bit skeptical about my sushi. As a result, he decided to taste the sushi first before offering to anybody. Good for him! He ended up polishing up more than half of the sushi I brought! And of course he shared the rest proudly with his colleagues, including his Japanese colleague. Later he told me that sushi wasn't as awful as he imagined. And he thought my sushi was pretty tasty too! Great improvement for someone who doesn't like seaweed, vinegar, pickle radish and avocado. hahaha. Finally, I made a batch of espresso walnut tiles for the Friday meeting last week. 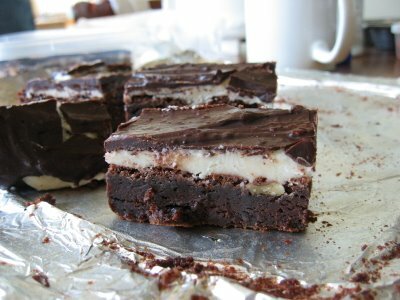 It was basically espresso walnut brownie, with cream cheese and chocolate frosting. We had a lot from one recipe, which was enough for 2 labs (one for his lab and another for the collaborator's lab, since they were having meeting on Friday too) and some leftover for us. Using almost a pound of bittersweet chocolate, these treats were really yummy. I gulped down a few pieces myself because the temptation was simply too great! Yesterday I whipped up a batch of mocha chocolate muffins with cream cheese frosting for OCT's colleagues. 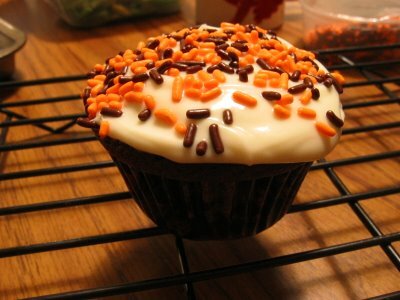 They are meant to be halloween treats.Basically, I just need an excuse to bake something. Since I was only going to bake 12 muffins, in which all would be bring to the lab, I figured I would be out of the temptation of chowing a couple down myself. This is the second time I used this muffin recipe. I really like the depth of chocolate flavor intensified by the instant espresso powder. 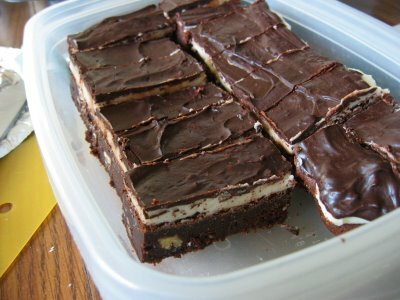 I remember reading from a book that instant espresso powder helps to bring out the chocolate flavor in the baked goods. I couldn't agree more. Maybe I will sneak in a tablespoon of espresso powder in my next biscotti project. The generous batter gave me 14 muffins. Which means I had 2 extra. 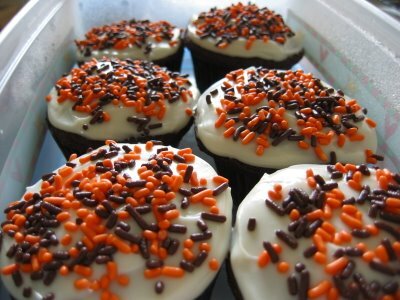 After I frosted them generously with cream cheese frosting and sprinkles, they went staight to the fridge. Other than the ocassional licking of cream cheese frosting, I hadn't been tempted by my sinful creations. Not yet. But you know, my determination is gone by the time I woke up this morning! In case you wonder, yes, I have eaten one this morning. Right after I woke up, and before I even brushed my teeth. And as I am typing this, the one left in the fridge is calling me out! I must focus on something healthier. Speaking of which, I have worked out twice this week at my apartment's newly installed gym. They even installed cable, which naturally comes with Foodnetwork, my favorite channel! So now, I can sweat and pant on the treadmill while watching Ina Garten make a smoke salmon fritatta. Not a bad way to spend 40 minutes. Preheat oven to 375°F. Line twelve 1/2-cup muffin cups with paper liners. Stir 1/4 cup hot water and espresso powder in medium bowl until espresso powder dissolves. Add buttermilk, oil, eggs and vanilla and whisk until well blended. Mix flour, sugar, brown sugar, cocoa, baking powder, baking soda and salt in large bowl. Add buttermilk mixture and stir just until combined. Mix in chocolate chips and pecans. I couldn't believe that I haven't jotted down anything we ate for the week. Time just flies with lightning speed, and I really didn't do much this week. Procrastinating is bad. Now I can't remember exactly what I made for the week. Let see. 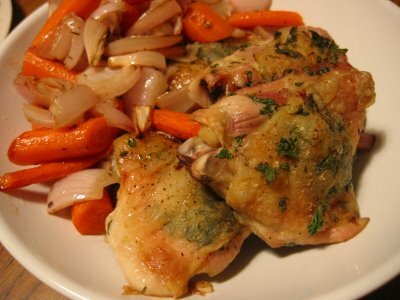 We had roasted chicken thighs with root veggies for dinner on Sunday night. Monday, we had an excellent spicy turkey cake with horseradish aioli and potato, corn and leek chowder. 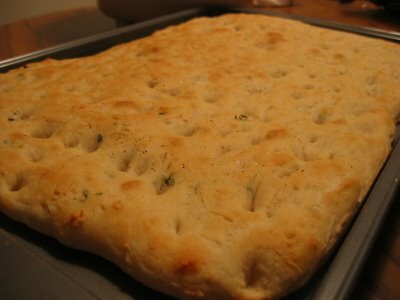 Tuesday, I started to get crazy about bread making and made a loaf of thyme focaccia.Dinner was a self invented, non picture worthy ham and pepper pasta with white wine sauce. 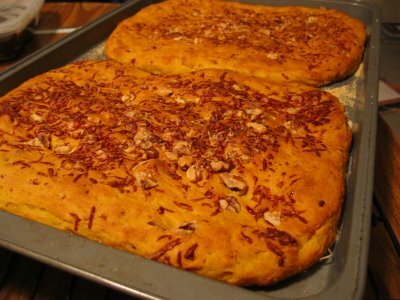 Wednesday, after a little success with my first focaccia, I went wild and made 2 loaves of pumpkin and walnut focaccias. Nevermind that both OCT and I don't like to eat pumpkin at all. Dinner was an old recipe of teriyaki chicken from Cook Illustrated. It wasvery good. I made a mental note to remember to make this fast and easy teriyaki chicken more often. Probably we can have a Japanese theme dinner and we can pair it with Japanese short grain rice. I could make some sushi too. But I think I need more than these two items to substantiate my Japanese theme dinner. Something to ponder about. Thursday, we have enough leftover, so I didn't cook. But I baked some Chockablock cookies (from Nov issue of Bon Appetit)for OCT's lab meeting on Friday, some apple strudel turnovers and my self-invented nutella, mango and kiwi in phyllo cups. I have high expectation on the apple strudel turnovers, but my first encounter with the phyllo dough turned out to be a disaster! 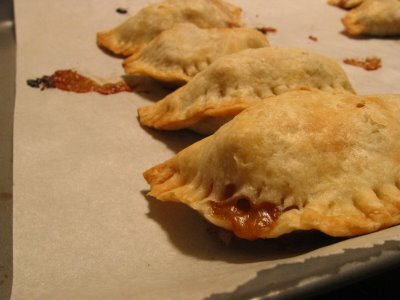 They were oh-so-delicate to handle, and didn't seem to be able to cover my apple filling. The end products were pretty horrendous. I was discouraged after making a dozen of these and decided to give up. But I was supposed to bring a dessert tonight, so I cut the phyllo sheets into small squares and make them into phyllo cups. 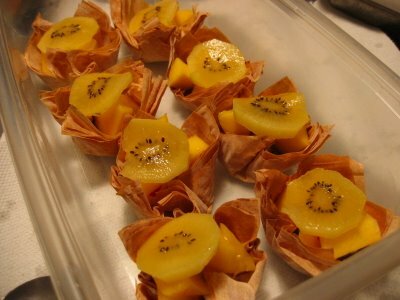 Then, I added the very sinful Nutella on the bottom of the cup as glue, and top them with mango bites and golden kiwis. Voila! Tasty and simply. 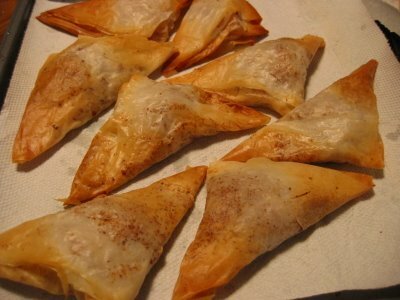 I should have done this instead of the time consuming apple strudel turnovers! These easy treats proved to be a hit when everyone took a second pieces after the dinner. 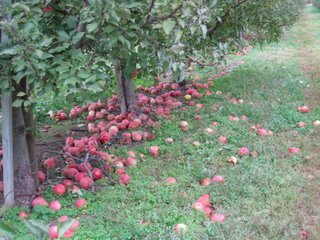 Something was wrong with blogger and the whole entry I typed about apple picking was gone. To keep the long story short, it was a fun day for us! The trip was initially cancelled because Dilip's son was running a high fever. After a few hours of rest, the fever subsided, and he called to tell us that the plan was still on. It was my first encounter with apple trees. And I was suprised by how short apple trees are. We were led to some Fuji Apple trees. It must have passed the peak apple picking season, as we didn't see many apples on the trees. Nevertheless, there were enough for everyone to munch, and pick for later consumption. Let's hope that someday food would be distributed evenly in the world. Do you believe in one good turn deserves another? I do! 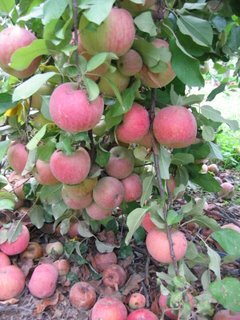 Just when I am hoping that someone will organise a apple picking trip, OCT's colleague Dilip asked if we would be interested to go this Saturday! It was so nice of him to offer, as he knew we don't have a car and definitely won't be able to go on our own. I am excited about the new experience, as usual. I must start to pull out all the apple recipes so that I will know what to do with my fresh, hand pick apples! By the way, Dilip is the guy whom I made a birthday cake for last week, while testing out a workable recipe for my friend Gerrie. Anyway, I guess I will bake him something again this weekend. If you think you are eating healthier by eating at home, think again. Yes, you are cooking your own meal and have perfect control on the amount of ingredients used. But, there are certain food that just scream : "FATTENING". Tonight's dinner is a good example. I made a quiche, using all the sinful ingredients I can ransack in my fridge. It was delicious. Because it was so, I started to worry that it may not be enough for both of us. So I went ahead and baked some frozen "beer-battered fish" because that seems to be the easiest thing to do when time is of the essence. 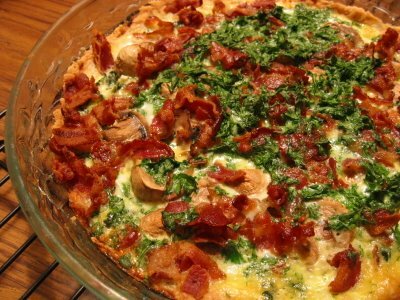 Though fatenning, this quiche is tasty and easy to make. I like to indulge in it once in awhile, or make it when we have guests over for dinner. There are many possible combinations in quiche, which is something I love about it. Versatility is important as far as budget is concerned. 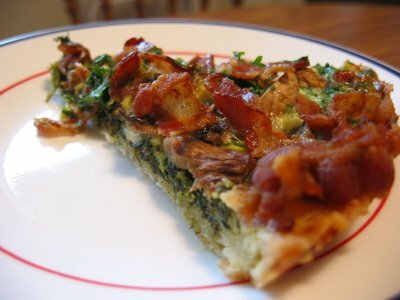 One thing that I like in my quiche is spinach. So I make sure I use spinach in every quiche I make. That's the only healthy ingredient in my quiche I guess. In a bowl with a pastry blender or in a small food processor blend together flour, butter, shortening, and a pinch salt until mixture resembles meal. Add water and toss until incorporated, adding additional water if necessary to form a dough. Pat dough onto bottom and one half inch up sides of a 7 1/2-inch tart pan with removable fluted rim or a 9-inch pie plate and bake shell in bottom third of oven until set and pale golden, about 7 minutes. While shell is baking, in a large skillet sauté spinach over moderately high heat until cooked. Remove skillet from heat and season spinach mixture with salt and pepper.Try to squeeze out as much excess liquid from spinach as possible and stir in one to two tablespoons of cheese spread. This helps to loosen up the spinach.In a small bowl whisk together eggs and cream. Sprinkle feta over bottom of shell and arrange spinach mixture on top, follow by crumbled bacon. Pour cream mixture over spinach and bake quiche on a baking sheet in middle of oven 15 minutes. Reduce temperature to 350°F. and bake until set, about 10 minutes.